Spotify is gradually supplanting digital downloads as the dominant way that we listen to music, with 10 million subscribers and 40 million active users across 56 countries listening to its 30 million tracks. With Spotify adding more than 20,000 new songs daily, it's definitely time for Spotify Connect, a new badge for hi-fi gear that enables effortless control of music across a phone, tablet and speakers. Allowing music to be sent direct from the Spotify app to any of these systems, Spotify Connect is a streamer's dream. Node is part of a family of dedicated, multi-room wireless streaming digital music players called Bluesound, which takes Spotify Connect and puts it in every room. Working through a home network – either via Wi-Fi or Ethernet LAN – and with simple control via the Bluesound app for any iOS or Android device, Bluesound's Node can also fetch tunes from a computer, a NAS drive, a USB drive, via Bluetooth and straight from the cloud. The app also has Rdio, WiMP, Qobuz, HIGHRESAUDIO, Slacker and Deezer built-in. Bluesound is all about creating a 24-bit native, pure-digital, multi-room wireless music streaming ecosystem. As well as Node, it's comprised of the Powernode one-box powered speakers, the Vault HDD and CD-ripper, the Pulse portable speaker and the Duo 2.1 system. For Spotify Connect, users will need to upgrade their Bluesound Players to software version 1.10.0 or higher. Wrapped in an Italian woollen coat of many colours, the Loop comes with a wall mount and a duo stand for putting on a shelf or table, and also a free app to optimise sound. Go for FullRoom audio, where the Loop's 120W tweeters and midrange drivers fire 2.1 audio off the walls to create a 360° sound. Streaming is possible via both Spotify Connect and Apple Airplay, with DLNA streaming from a PC or laptop also possible. It also features PlayDirect, creating its own Wi-Fi network for instant streaming from any device that can get online, as well as a USB slot and a 3.5 mm audio minijack. Those who like their speakers to look a bit special should look no further than the white, high gloss, lacquered wood of these Fidelio SoundSpheres from Philips. Handcrafted from wood to achieve a natural sound, the DS9830W's designers have sought to curve the wood in such a way that vibration is avoided and sound not distorted. Featuring free-floating tweeters that deliver a 360° sound, these speakers are supposed to mimic a live performance, though it's how they get their tunes that really excites. As well as Spotify Connect, the Fidelio SoundSphere DS9830W also allows streaming using Airplay from Apple devices. Known colloquially as the M7, this speaker is part of Samsung's quest to move beyond TVs and phones and into the audio sphere. The Shape concept now comes with Spotify Connect, Bluetooth and Wi-Fi (though no Apple AirPlay), and links to other speakers in the Shape ecosystem, such as the smaller, more compact M5. Multi-room music control is via the free Shape app, while all Samsung Shape speakers can talk to its latest TVs and Blu-ray players, such as the Samsung UE65HU8500 and Samsung BD-H8900. Those with posh home cinemas using top speakers will baulk at some of the puny all-in-one systems featured here, so here's something to grab their attention: one of the world's finest home cinema-grade AV receivers, complete with Spotify Connect. Pioneer's flagship nine-channel SC-LX87 has 4K video pass-through, nine HDMI inputs and three outputs, and the quartet of DLNA networking, Apple AirPlay, HTC Connect and Spotify Connect. Add a USB port that's able to play Apple Lossless, AIFF, WAV and FLAC formats from a thumbdrive, and the SC-LX87 is perhaps the most versatile – as well as powerful – AV receiver yet. Danish luxury brand Bang & Olufsen just had to embrace the latest streaming tech, but it's got way more to boast about than just Spotify Connect. Designed to look like a piece of furniture (in who's house we're not sure – perhaps a hipster's East Side warehouse conversion), the 480W BeoPlay A9 doesn't have volume controls; just swipe a hand across its top. Fetching tunes via DLNA networking from Windows computers, Apple AirPlay or Spotify Connect, the 28-inch diameter BeoPlay A9 is available in white, black, silver, red, green, brown, blue and Nordic Sky, the latter inspired by the intensity of Scandinavian summer nights. Yes, the BeoPlay A9 is THAT kind of speaker. Portable at a mere 1.8kg (4lbs), the Libratone Zipp links to a smartphone via Bluetooth for easy one-touch streaming of music, and as of now includes Spotify Connect as well as both Apple Airplay and a Wi-Fi Direct-powered PlayDirect function, which turns each speaker into its own hotspot. Owners of HTC phones get a look-in, too, with HTC Connect allowing a three-finger swipe up the screen of the phone to send music instantly to the Zipp. Capable of producing some of the best wireless music we've heard from a portable speaker, the Zipp has a nifty grab handle for carrying from room to room. It's about the size of a flask and, thanks to its interchangeable wool covers, it's disguised as one, too. Fresh from a barnstorming performance on Kickstarter is Rocki Play, which upgrades all of your current speakers to Wi-Fi. Not only does it then allow multiple smartphone users to send songs to any speaker with a Rocki Play attached, but it's a modular system. Stick a tiny Rocki Play in each room in your house and you can sync a track to all of them, creating instant multi-room audio. The Rocki app for iOS and Android currently plays local music on a phone as well as from NAS drives and other sources on a network. Spotify, Deezer and a whole long list of streaming services – including radio stations – are about to be added to its app. Small but super-expensive, Sony's SRS-X9 wireless speaker is loaded with audio prowess. It's got Wi-Fi, DLNA and Airplay compatibility on top of Spotify Connect, and can also access Sony's own (and increasingly impressive) Music Unlimited service, along with TuneIn Radio and Pandora (in the USA). A 154W one-box system housing seven speakers, each with a dedicated digital amplifier, the SRS-X9 is all about precise and hi-res sound reproduction. The S-Master HX digital amp technology is accompanied by Sony's DSEE HX tech for boosting compressed files to a higher resolution. There's also a SongPal app that takes care of both music playback and the SRS-X9's settings. Sony has other wireless speakers, the smaller SRS-X5 and SRS-X7, which also play nice with Spotify Connect. The diminutive 320x180x145 mm (12-5/8 x 7-1/8 x 5-3/4 inches) Pioneer A1, weighing just 3.5kg (7 lbs. 4 oz) has got connectivity completely sorted. 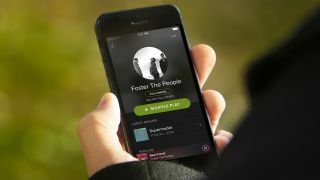 Spotify Connect is under the bonnet with Apple AirPlay and DLNA networking, and the A1 adds HTC Connect, too. Better still, the A1's Wi-Fi Direct signal means no home Wi-Fi network is required. Complete with a USB slot, 3.5mm mini-jack and a Ethernet LAN for optional wired networking, the A1's stereo speakers have separate tweeter and woofer units for more detailed response, while bass is boosted by a bass reflex design that helps low volume music impress.